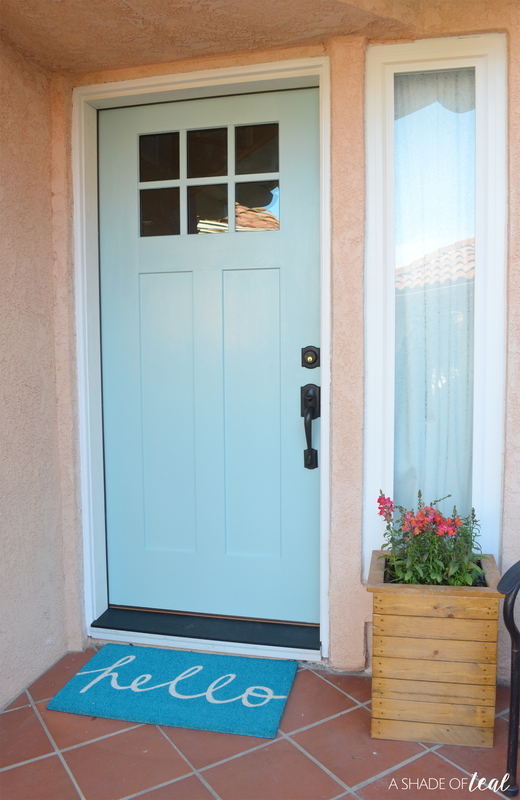 Last month I shared how I was finally updating my builder grade door with a NEW Therma-Tru Benchmark door exclusively available at Lowe’s! Well I’m so excited to share with you that it’s finally here and installed! You can read all about my experience of Shopping for a New Front Door HERE. But to give you a quick update our front door was original to our home, which meant it was over 30 years old. 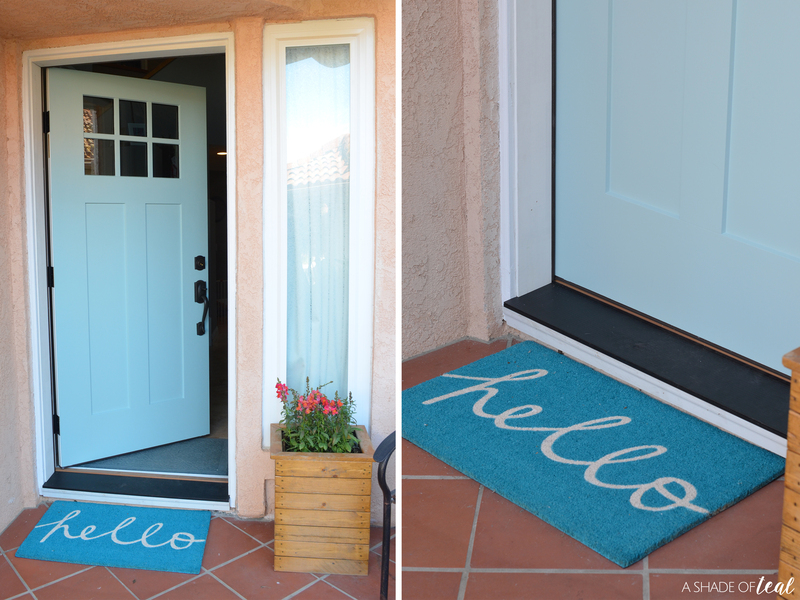 I have previously updated my door with paint, but ultimately my goal was to have a new door installed. Well, it’s done! You can’t imagine how excited I am to have a new door, especially a door that is well insulated. I’m so happy we went with a fiberglass option from Therma-Tru Benchmark, exclusively available at Lowe’s. Below is a before picture of our builder grade door. This picture was after I gave it a new coat of paint. It may look good from the outside, but from the inside it wasn’t sitting flush with the frame so outside air was leaking through. It’s only been a couple days since having our new fiberglass Therma-Tru Benchmark door, but I’ve already noticed a huge difference. Besides no longer having a gap at the top, it feels insulated and we no longer have outside air coming in. Plus, it’s much quieter and I don’t hear outside noise as much; something I never even thought about before. If you’re wondering we selected the Shaker 6-Lite Craftsman door with Clear Low-E Flush-Glazed Glass. 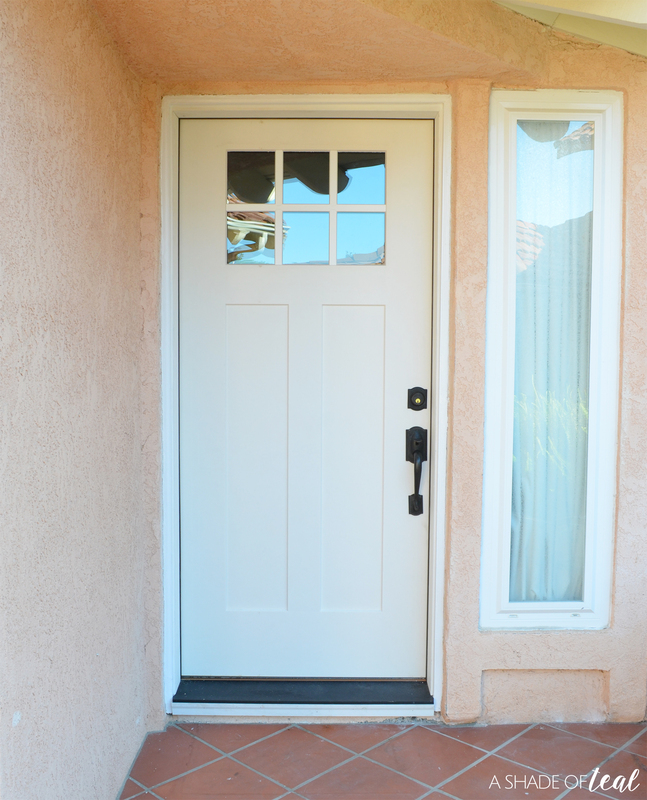 It’s a fiberglass door that comes in a smooth finish and is prepped and primed in a white color. 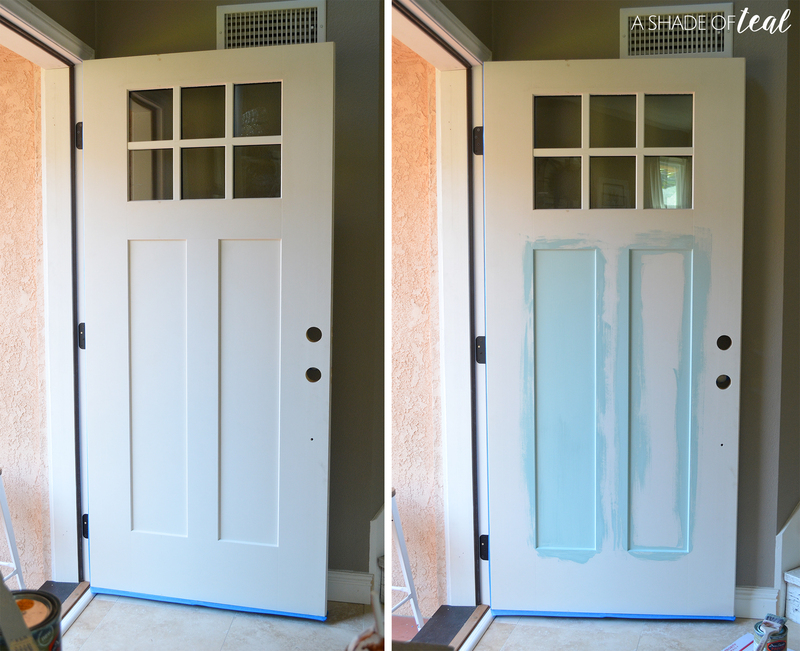 We had the door professionally installed, but I’ve already been busy painting the door. As you can see I kept the same color I previously used on my last door. 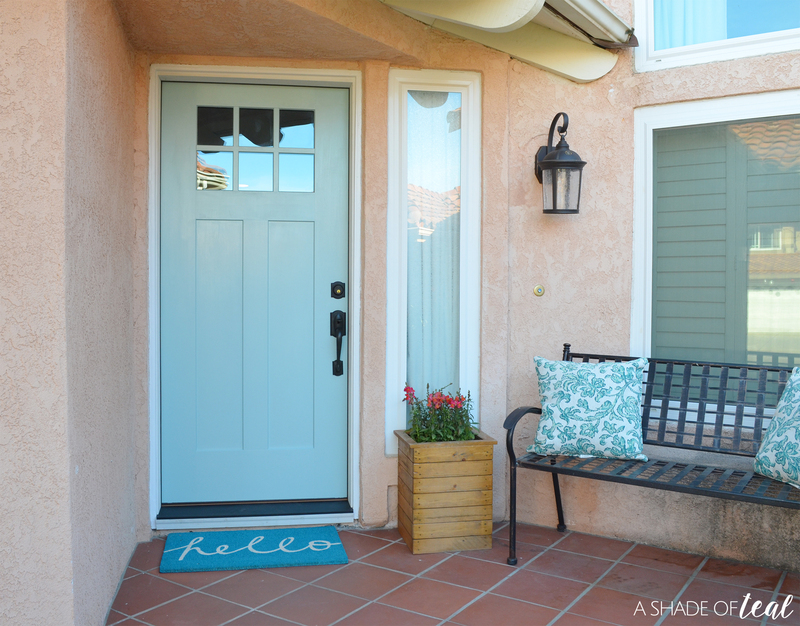 I just love the aqua shade since it sits so well with my house color. 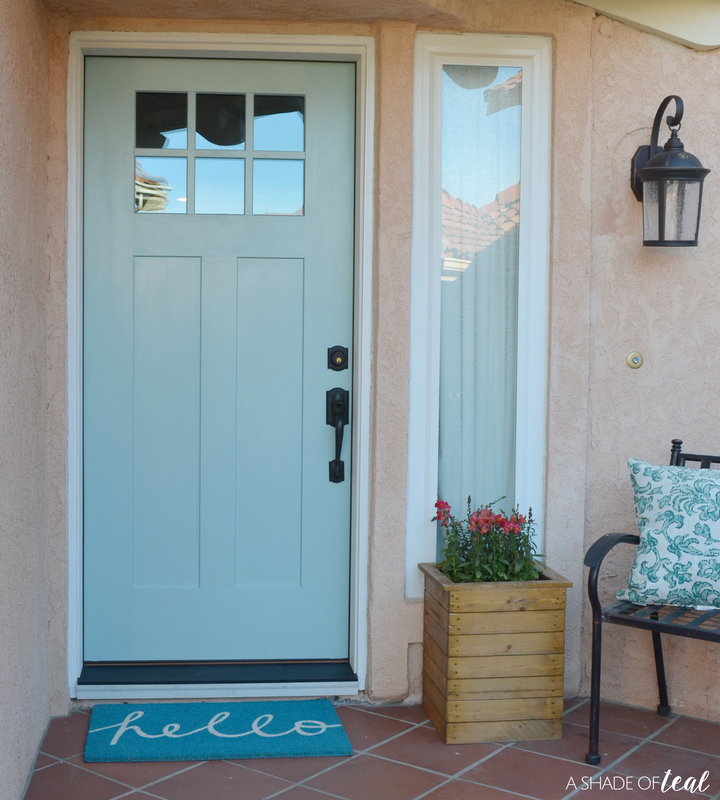 If you’re looking for more tips on how to install the door, or how to paint the door, you can find more information here. Painting the door took no time at all. Since it was already primed and ready to paint, it took 1 coat and it was done. I painted the exterior an aqua color, but for the interior side I painted it white to match my trim. 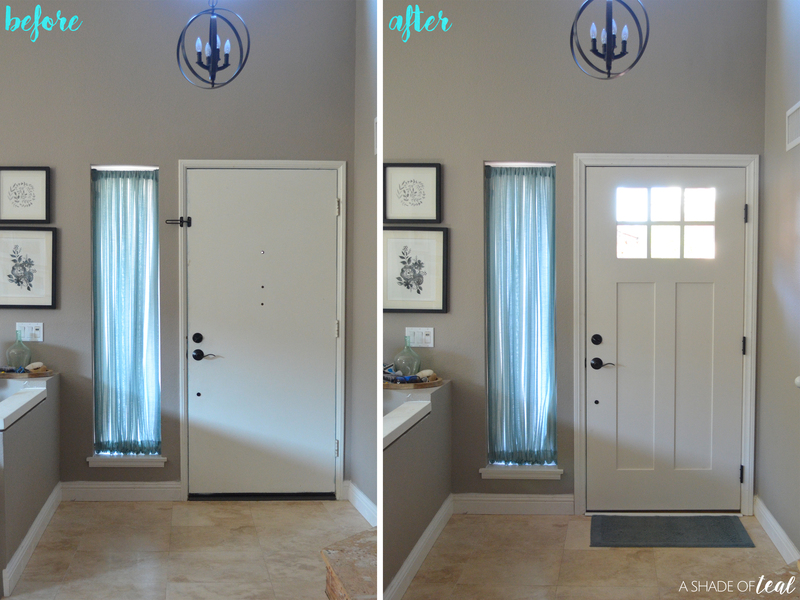 I’m loving the modern style of the door, and the 6-Lite windows now let in so much more light on my entry. Besides my Therma-Tru Benchmark door being practical, it now suits my style. 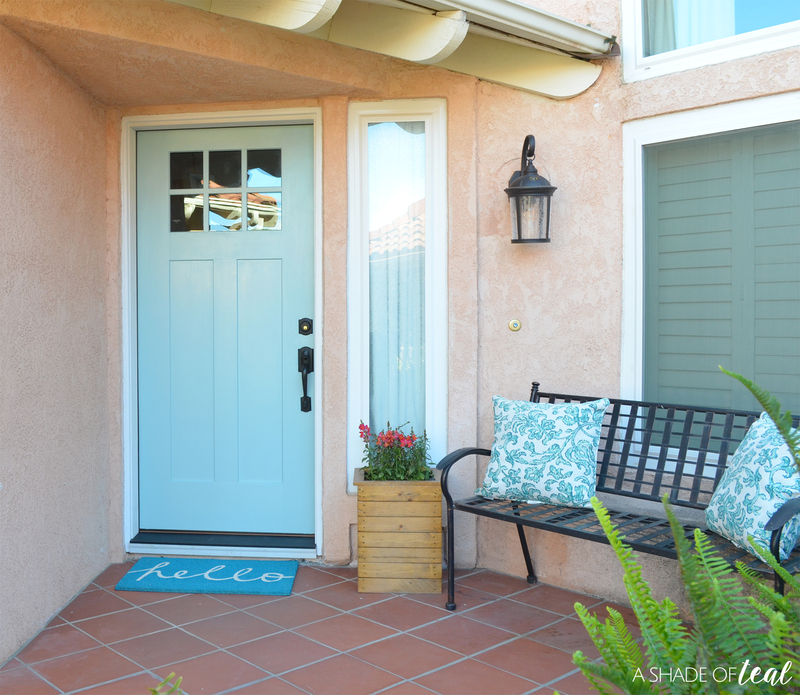 I already have plans to continue updating my front entry with board and batten. 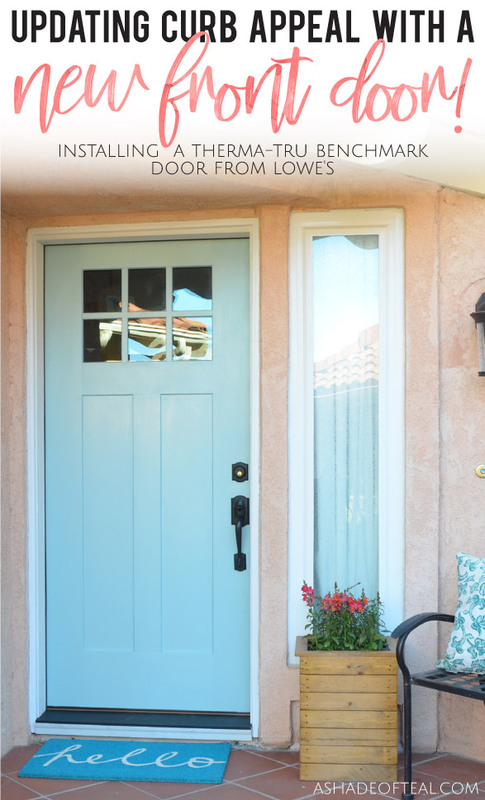 I can’t say enough how much I love our new Therma-Tru Benchmark door exclusively available at Lowe’s. 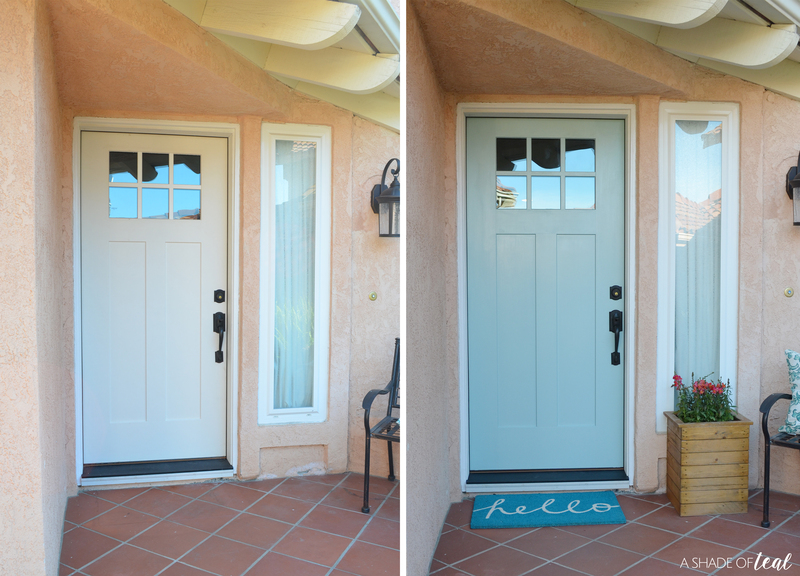 It’s been a top priority on my list since the day we moved in, but finally having a new insulated door has made such a huge impact to our curb appeal. 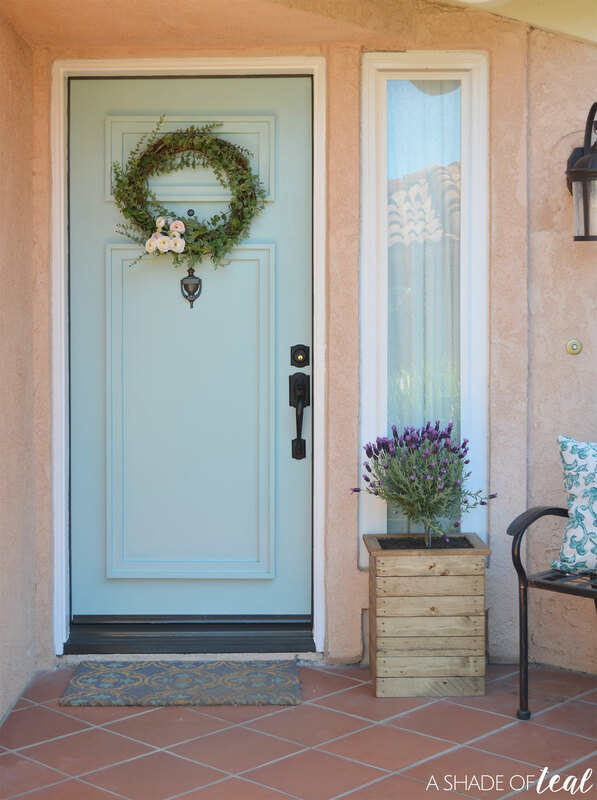 If you’re looking to upgrade an old door you might want to check out these suggestions of things to consider first. « Exploring the 2018 HGTV® Dream Home! It looks so great! We’ve been thinking about a door like this for our house, may I ask you how much everything cost with the Professional installation and door included? Hi Abbie! The installation was just under $500, that’s with the old door removal as well. 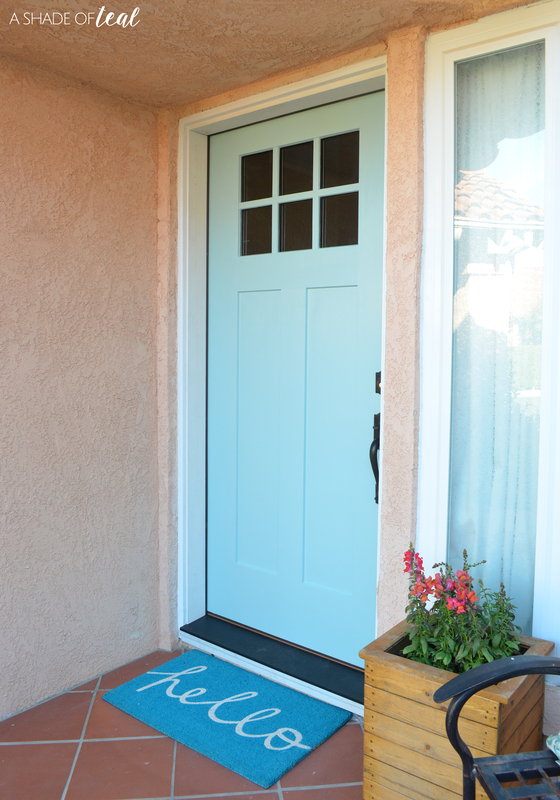 Then my particular door cost about $850 since I had to custom order it since my dimensions were not typical. Worth every penny though!